The Arioso Trio is a group of classically-trained musicians based in Pittsburgh, Pennsylvania. We are available to perform wedding ceremonies, cocktail hours, receptions, holiday events, anniversary parties, corporate events, or any other special event. We have a vast repertoire of classical, popular, traditional, and sacred song selections for you to choose from. The combination of flute, oboe, and cello played by master musicians creates a rich, beautiful sound that is sure to add elegance to any occasion. Visit our listen page for samples. 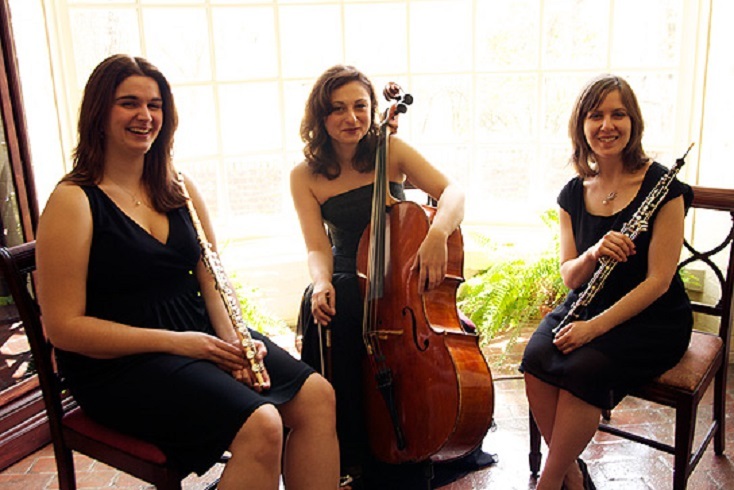 You will not find another ensemble like the Arioso Trio in the area. We've blended the deep sound of the cello, the rich double-reed quality of the oboe, and the light timbre of the flute to create a unique, unforgettable sound. Whether inside a church, in a garden, or in a reception room, the Arioso Trio creates perfect ambiance for both indoor and outdoor events. We will make sure to provide the highest quality services and customer satisfaction. Please note Arioso will also travel to Mc Kees Rocks, Carnegie, Glenshaw, Homestead, Presto, Allison Park, Bethel Park, Braddock, Bridgeville, Coraopolis, Ingomar, Morgan, Oakdale, Sewickley, West Mifflin, Wildwood, Cuddy, Dravosburg, Duquesne, East Pittsburgh, Indianola, Oakmont, Turtle Creek, Verona, Gibsonia, Glassport, Imperial, Library, Mc Keesport, Sturgeon.